At a CMS Open Door Forum call last week, highly anticipated changes to the Five Star Rating were announced as a sneak peek for providers. The official release to the public will be on February 20th, 2015 and the revisions appear to have created a shakeup in many facilities’ ratings. CMS issued an S&C letter on February 13th, 2015 that outlines these changes to Nursing Home Compare for 2015. Raising the bar for performance – Quality Measures have been adjusted to raise the standards for nursing home performance on these measures. 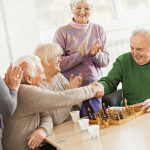 This significant change to the scoring calculation means that many nursing homes have had their scores decline in the QM rating, which means their Overall Five Star Ratings have most likely declined as well. 2 new Quality Measures included in score calculation – Two new measures for the use of antipsychotic medication use in both long-stay and short-stay residents have been added into the Quality Measure calculations. Residents with three diagnoses have been excluded from the calculations. These three diagnoses are Huntington’s, Tourette syndrome and schizophrenia. Targeted Surveys are being expanded – In 2014, CMS announced that it would be adding focused survey types, including an MDS 3.0 survey. A pilot has been completed for the MDS focused surveys to see how resident assessments are calculated and the accuracy of information that is reported to CMS. Going forward, the MDS survey will be rolled out nationwide with surveyor training starting in April 2015. View CMS S&C Letter “Nursing Home Compare ‘3.0” – Five Star Quality Rating System – Expanded and Strengthened” (Ref: S&C: 15-26-NH) on the CMS website.